In one of the first questions on this site, "If I was" vs "If I were", there are a slew of answers. The question had a somewhat more recent (Feb 2018) spate of activity with a very authoritative, nuanced, and reliable answer. Up to that time (and even up to yesterday) the highest voted answer, done on the day of the question 9 years ago, upvoted at a whopping 93, was basically Just use 'were'. But this is all in the past. Sometime in the past day or so, the answer was flagged (I am not a mod so I don't know the flag reason), and a mod deleted the answer. For the life of me, as much as I might disagree in fact with the answer, I see nothing that is flaggable or deletable in the answer. It's not very deep, not really the best quality, not exactly supported with data. But it is a highly upvoted answer, and I think that should stand for something. Now, I hardly know the difference between a spate and a slew, but I think I know when the subjunctive is used in English, and that is... well it's complicated. Some people still use it, mostly young people have never heard it and bridges still seem not to collapse any more often. Sometimes my lumbago really flares up when I hear kids trampling my lawn saying "If I was a rich man...", but when I put on my linguistics hat, the subjunctive is mostly dead in English (just like 'whom'! ), so I think of the answer as 'mostly wrong'. But it seems like a misuse of flagging. What is there to flag? There's nothing rude or spammy, it's totally an answer. Don't go against the operation of the system, use the system. Downvote that sucker if you don't agree with it. Those guys back then only had one vote each like you, they all liked the "If I were..." always answer. Just like you might on another question. You want your votes deleted? More importantly, you want 100 upvotes for your answer deleted? So, please undelete that answer. Comment on the answer and down vote it and say it is wrong (but please give reasons and don't just say 'you are wrong nyah nyah nyah') and up vote the answer you think is right (It's tchrist's. Really). There is a case to be made that a judge should be able to override a jury. But if thats the case, the precedent you want to make, there's a boatload of old questions, starting from Aug 2010, that we have to go through and delete because those old people are effing wrong. I'd like people not to vote here about the subject, subjunctive, but about whether a mod should hammer delete a highly upvoted question that some people in comments disagree with. And I hope you vote here to have the question reinstated so we can downvote it and upvote ones you think are right. Update Mar 25, 19: Thank you mods for undeleting. Everyone: act on that question as you would. The answer to Should I nominate incorrect answers for deletion? seems to be “downvote don’t delete”. Even for suggestions like Requesting review of technically inaccurate answers the answer is downvote, comment, and maybe ask a moderator to put a notice on the answer. Deleting an answer that has no other problem than it is old, highly scored and possibly incorrect does not seem to be a supported method of dealing with this well-known issue. Not one of the highest scored answers to these questions suggests taking steps to delete an incorrect answer. I would also suggest that even though I personally don’t believe anything untoward was going on, there is an appearance of a conflict of interest when a moderator has a competing answer. At a minimum, the possibility of deleting the answer should have been discussed on meta before it happened. There was no urgency in removing it (as far as I can tell) so I don’t understand why it wouldn’t be brought up for discussion. The vast majority of guidance, particularly discussions where Stack Exchange employees have been involved, discourages deleting answers because they are wrong. I don't see a clear and compelling reason to contravene that guidance, especially when the recommended methods of dealing with the issue were already applied. The question has been protected to prevent answers from new users, but it's not clear to me why that protection is permanent. The accepted answer has a good score and also has a bounty awarded to it which gives it plenty of credibility and weakens the argument that the other answer is dangerously wrong. A moderator decided to remove an 8 year old highly scored answer without clear consensus from the community, based on a flag from another user whose answer to the same question was criticized, and where a moderator has a competing answer, which makes the whole thing look a bit shady (even though I am confident that there were only good intentions involved here). I understand that it is disturbing when a dubious answer far outscores a careful and authoritative answer. However, a number of factors suggest to me that the present case is not an especially hard one to judge. Essentially, the key elements in the controversy are a no-research-shown question posted on August 13, 2010; a brief (four lines) but confident-sounding no-research-shown answer also posted on August 13, 2010; and a lengthy, serious, carefully argued answer posted on February 24, 2018. There are also nine other live answers that have received at least one upvote, and five other answers that were deleted in the more distant past after earning net scores of 1, 0, –1, –3, and –4. It is noteworthy that of the nine also-ran answers, two (one posted on August 13, 2010, and the other on September 8, 2010) are only three lines long and two others (coincidentally also posted on August 13, 2010, and on September 8, 2010) are only four lines long each. The extreme brevity of these answers and their paucity of reasoning or corroborating evidence reflect the standards of the time, obviously. But it bears noting that the only indisputable qualitative difference between the now-deleted brief post and the four still-live brief ones is that the deleted one had received a net upvote score of 93 (103 up and 10 down), while the four extant shorties have net scores of 30 (30 up and 0 down), 13 (26 up and 13 down), 13 (16 up and 3 down), and 4 (5 up and 1 down). On this record, it appears to me that the 93-vote short answer was deleted not because it was worse than the other four short answers, but because it was more popular than they and the other posted answers were—so popular, in fact, that it was getting in the way of the obviously superior (and longer and much more recent) answer that arguably deserves to have the most votes. But by remarkable good luck the original poster came back at least seven and half years after posting the question and awarded the green check mark to the long, high-quality answer. As a result, the long, better answer now sits at the top of the series of answers, in immediate view of anyone who wants a detailed analysis of subjunctive use. Under those circumstances, I don't see how we can argue that the short, superficial answer is keeping the long, deep answer down. It simply isn't in a position to do that. To the extent that anyone is disturbed that the old, short, opinion-based answer has substantially outscored the better longer answer, all I can say is, that's how it goes at this site: a lot of people (including a number who cast upvotes and downvotes) prefer short superficial answers to long closely argued ones. (In fact, one voter disliked the long answer enough to downvote it, leaving it at the moment with a net score of 45 upvotes [46 up and 1 down].) If you don't like the results, I recommend that you (1) upvote the answer you think is good, (2) downvote (if you must) the ones you don't like, and (3) call attention to the answer you think is especially meritorious—perhaps by presenting it with a bounty for being exemplary and deserving of more recognition (it already has had one bounty awarded to it). I do not think the deleted answer should have been deleted. I think it should be reopened and subjected to the same vicissitudes of the voting public's opinions that all other answers are, assuming that they satisfy the criteria for answers prevailing when they were posted. In my opinion, if the deleted answer were reinstated, the longer and much better informed answer would gradually gain ground on it anyway, thanks to its inherent merits and to the boost it will continue to receive from being the answer accepted by the original poster. Update (3/28/19): In the eight days since Mitch opened this Meta discussion, the detailed, comprehensive answer has received 5 additional upvotes and no additional downvotes; the brief, highly upvoted, temporarily deleted answer has received 2 additional upvotes and 6 additional downvotes. The gap in net upvotes between the two answers has thus dropped from 48 to 39. It will be interesting to see how voting on these answers proceeds in the longer term, now that the immediate controversy has subsided. I am disturbed by this deletion. The answer may not have been a good one (although the number of upvotes clearly disputes that)—but, in all other cases, whether an answer (or question) is good is reflected by the community. Only if an answer (or question) clearly violates the code of conduct should it ever be deleted by a moderator. And, even then, there is nothing in the rules of this site that says that X number of downvotes should result in deletion. Further, in this case, it was the opposite. This answer received a great many upvotes. The community, as a whole, appreciated it and thought it was a good answer. If a moderator objects to something at a personal level, they should do what everybody else does: comment on it, provide an answer of their own, downvote it, or vote to close it. That is no different than what anybody can (and should) do. For a moderator, personal opinion should weigh no more nor less than personal opinion for anybody else. Just because a moderator has the ability to wield moderator tools that should not give them the right to do so. I'm glad to see the community weighing in to have this undeleted. At least on the face of it, I am appalled that it was deleted in the first place. Having said all of that, I want to reaffirm my claim that things may have gone on behind the scenes that I'm not aware of, and there may have been justification for its deletion that can't be made public. I certainly don't want my answer to be taken as any kind of personal attack. I just want to express what my take on this is, based on the facts I'm aware of. For users who do not have 10K rep and cannot see the deleted answer, here it is. And, yes, I had already downvoted it. It will make you sound smarter and it is technically correct since "the subjunctive mood is used to express a wish or possible situation that is currently not true." November 24, 2011 it had a score of 22. September 24, 2013 it had a score of 41. September 23, 2014 it had a score of 48. April 04, 2015 it had a score of 51. June 29, 2018 the score rose to 80. I think you hit the heart of the issue here, this site is not about gathering up votes or farming reputation, it's about questions (note; no adjective) and good-quality answers. I specifically say questions and not good questions because any question can be good. The reason this site later introduced a higher standard on questions is not that low-research questions cannot be helpful, it is because the site cannot cope in terms of moderating with the stream of such questions being dumped here, often having been asked before or being very basic to the extent that they are better suited at ELL. That being said, there is an important reason why moderators have the power to delete any post, it is because it's hard for the community to delete highly up-voted answers. Indeed, such an answer would have to be voted down a lot before anyone can cast delete votes. In some cases, those moderator judgement-calls are without controversy. For example, moderators on Politics.SE regularly delete partisan rants which don't answer the question or merely recite campaign rhetoric that's not based in fact but have managed to gather quite a few up votes in a short span of time. Indeed, up votes are an indication of quality, but they aren't always right. That's where moderators come in. 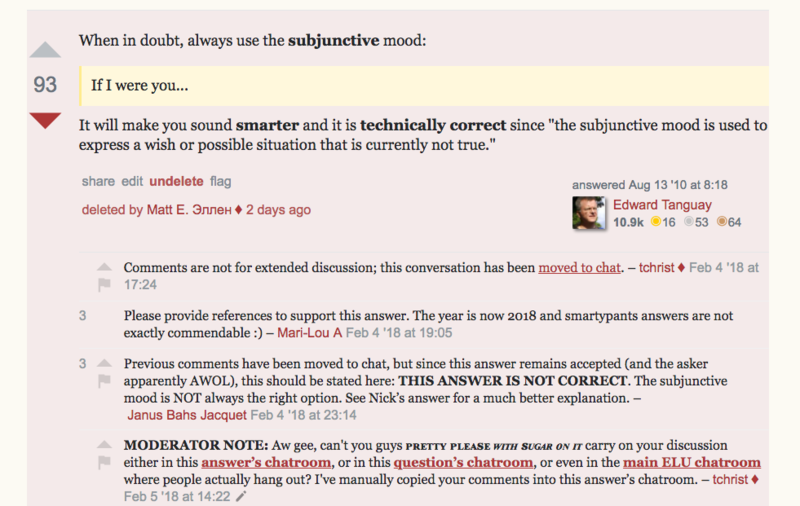 I'd like people not to vote here about the subject, subjunctive, but about whether a mod should hammer delete a highly upvoted question that some people in comments disagree with. In conclusion, I think the question should not be whether a mod should do this, but when a mod should do this. There could be a consensus that mods should consult Meta first. Whether or not that's a good idea is up to the community. I admit I'm no linguistic scholar, not by a long shot, so my judgement could easily be off. My reasoning for deleting the answer was that many our members that I believe to be professionally involved in linguistics thought the answer was misleading and the answer had a lot of upvotes. The question will recur and will get the same kinds of idiotic answers because there are more idiotic answers available than sane ones. It could easily be seen by someone else like me, who doesn't know what the correct answer is, as the correct answer. Which meant to me that the answer was noise, and should be silenced, because it would be a long time before anyone got around to down voting it. Edit for clarity: If the community is against what I've done, I'll undo it. Not the answer you're looking for? Browse other questions tagged discussion answers deleting-posts . Is using “colored girls” as an incidental example offensive or unwelcoming? Are “flag for moderator attention” flags increasing, and are they “a good thing”? Is it correct that a user chooses the correct answer? Deleted Upvoted and Popular Question: Why? What is the logic of counting SWR answer with zero upvotes towards the total needed for a badge?